This is my husband’s Valentine gift. He picked out the fabric, a Moda line, and the pattern. He has been very encouraging and supportive of my hobby. He is quite happy with it. Glad he loves it. Happy Valentines to all. 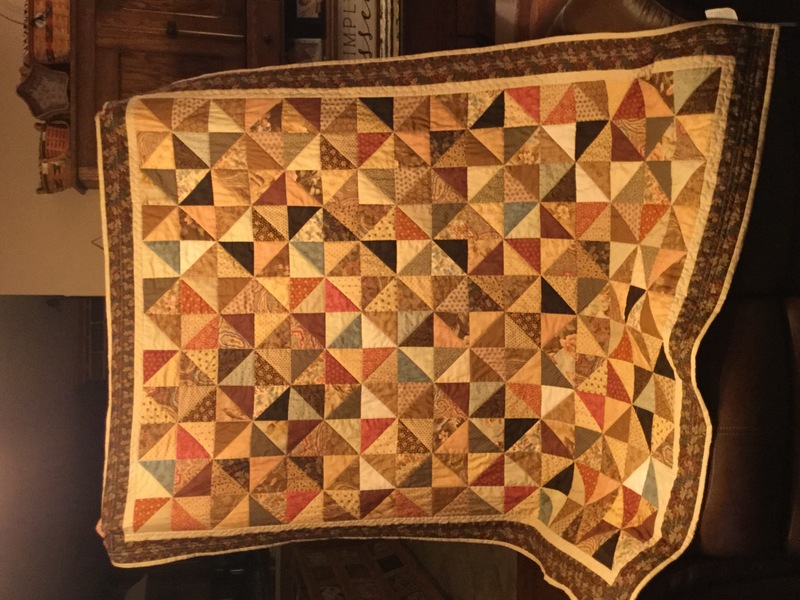 How nice to make a quilt for your DH too. A great way to thank him for all his support. Happy Valentines! His quilt is beautiful! You did great!! That is a wonderful, manly quilt for your "valentine". Wonderful gift for your hubby! Beautiful! That is one gorgeous quilt for your Valentine!!! Lucky him to get this beautiful quilt. No wonder he is happy with his gift. It is just lovely! And he chose great fabrics. It will be wonderful to cuddle under on Valentine's Day. Great quilt for your husband. It is wonderful that he is so supportive of your hobby. I am blessed in the same manner. He will love it! Great quilt. My very first quilt I made 53 years ago used that pattern. My Mom gave me a box of scraps, a card template and told me what to do and my love for quilting began. Your quilt brought back memories for me. Thank you. I would be very happy with that, too! Love your quilt and also love the fabrics you husband chose. So glad he supports your hobby. I think he is a keeper for sure. Great quilt for your DH. Such a deserving guy! My DH is very supportive, too. Your husband is a pro already in choosing fabrics and patterns. You can make him your co-designer for future projects. Great quilt! Great color choices. It came out wonderful. How fun. Enjoy Valentine's Day with your hubby. Beautiful quilt. He did a good job.